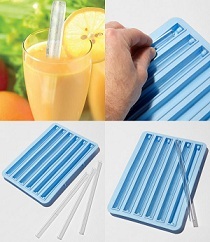 Easy invention ideas: you can have them too! Are you looking for easy invention ideas? You might be on to something. Some of the best most helpful inventions have been based on easy concepts, nothing too complicated or techy – just a simple idea that makes life easier. It still doesn’t mean that developing your invention idea and bringing it to market is going to be a walk in the park –it will most definitely involve some work. However, when you know you have a winning concept in your head – the work is worth it, as you are more likely to easily make a profit out of it, and if it is simple it is more likely to be appealing to many potential customers. Sometimes the most easy invention ideas can prove as great inventions, solving a real need and being successful in the market. To get some inspiration and to help you find some easy invention ideas of your own, check out the quirky shop which features simple invention ideas that were conceived by people just like you. This is a known successful method for inventing that not many people know about. It involves making dependencies, or new connections that didn’t exist before between different attributes of an existing product. To try using this one yourself, look at an existing product and try to list all its different attributes, like shape, color, feel, temperature, height or anything you can come up with that is relevant to the product, and makes an integral part of what the product is. Then, make a list of attributes that are external to the product, but relevant to its functioning. For example something the product interacts with or is in touch with. For example, a thermometer has a set of attributes that are internal, such as its weight, shape and color. An external attribute from the immediate environment of the thermometer can be the temperature of a person using it. It’s relevant to the functioning of the thermometer but is not part of the thermometer. Ok, now that you have clearly identified the different parameters we can start our exercise – creating dependencies where none existed before. In our thermometer example we can create a new dependency between the color of the thermometer and the temperature of the user. 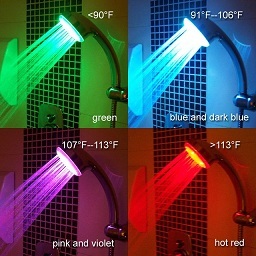 A shower head that changes its color based on the temperature of the water flowing through it. The color of the water flowing through the shower head changes, based on how warm the water are, allowing anyone about to enter the shower to know how warm the water is, without the need to touch and get scalded. 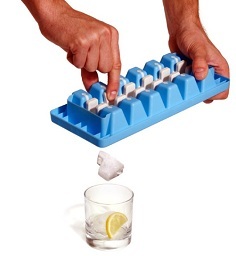 Can you think of similar useful invention idea? For more examples of products created using the attribute dependency method, and to learn more on how to use the method, make sure to visit our page on ideas for new inventions. The idea behind this thinking method is to look at an existing product and its different components, and to try and add a new additional task to an existing component. What product which you use in your daily life or one you are highly familiar with, could use an additional function to one of its components? Let’s look at some examples of invention ideas that illustrate how the task unification process works. 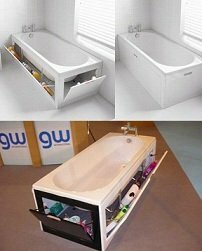 A bath that uses its sides as cupboard containers for bath products – in this example, one component of the bath – its sides, originally used to contain the water inside the bath and the user, are added an additional task – to contain bath products. 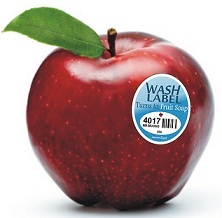 Fruitwash - These fruit labels, dissolve into an organic fruit cleansing produce wash, when wet with water, and help wash fruit and remove pesticides, bacteria and dirt. The label, originally used to identify the fruit and its origins is being given the additional task of containing soap to wash the fruit. A great way to come up with easy invention ideas is to keep a frustration diary. Try to identify the simplest frustrations you are encountering in your life or those that you witness others experiencing. Things that if solved are not necessarily life changing, but could make our lives just that little bit easier. Everyone wants comfort, and if you manage to come up with the simplest easiest idea – but one that will help solve one such problem, you have a great invention idea on your hands. Yes, it might not be the next multimillion dollar success, but it might set you off on the path of invention and generate a nice income on the way. 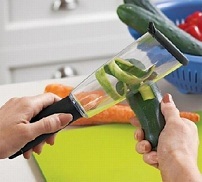 Cucumber peeler that keeps the peel in a container, helping you keep your surrounding more tidy. 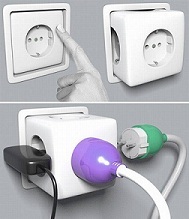 Socket multiplier that disappears into the wall, when it’s not used, creating less clutter. This method asks you to look at a product, and like in the attribute dependency method, to make a list of all its components. Then choose one component and multiply it – essentially, create a new copy of it. However, here is the trick: use the additional copied component differently. You need to change some variable of the multiplied component, such as its size, its location or another attribute. Do this exercise several times, with different products you would like to innovate on – then try to come up with new uses for the new product that includes the multiplied component. 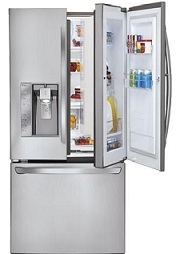 The new LG refrigerator with a ‘door in door’ feature. This new recently launched refrigerator copied the door feature and moved it to a different place in the fridge – inside one of the existing doors of the refrigerator. The result: more space to store food inside the fridge, without increasing the external size of the product. Serious about inventing? Educate yourself! Tarlow has 81 US patents to his name and has developed 400 products worth over 1 billion dollars in retail sales, so you know he knows what he is talking about (check out the list of inventions he came up with on the course page, to the left - talk about inspirational!!). The course is very affordable considering the wealth of information he provides, and you get lifetime access to 47 video lectures (more than 6 hours of quality content) on topics ranging from coming up with an invention idea, figuring if it would sell, to easily licensing it to make money through royalties. It is a truly great resource for anybody interested in inventing. Check the course outline to see all the topics covered. I highly recommend it.